It is important to remember that while lilies are lovely to see and smell, they are a serious safety threat for our cats. 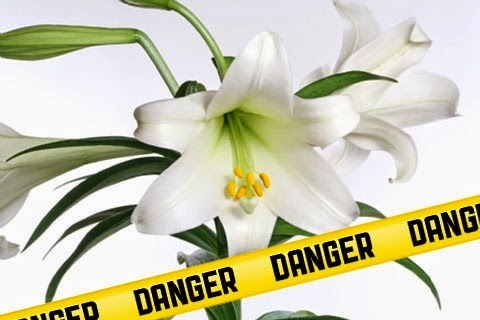 The entire lily plant (leaf, pollen, and flower) is considered to be toxic for cats, and it only takes a smidgen to be deadly. Every year, especially around Easter, many cats become critically ill, end up with kidney failure and some die due to Lilly ingestion. Symptoms of lily toxicity in cats include lethargy (decreased activity), vomiting, and loss of appetite. These symptoms worsen as kidney damage progresses, leading to death. Early veterinary treatment is critical. If you suspect that your cat has eaten any part of a lily or its pollen, call your veterinarian immediately. Holidays are times to celebrate with friends and family. Your feline friends want to celebrate with you. Please do your part to “cat-proof” your home in order to keep them safe this holiday season, and spread the word about the dangers of this common plant.